Hi, Lately I found out about the YN622Tx rumor (or wish) (covered here) this trigger uses radio to communicate between the camera and the the units it controllers very similar to the YN622. The other type of triggers or commanders uses CLS in Nikon and Infra Red to communicate with Canon flashes or third party units that supports this feature (I’m not familiar with Nikon methods, so I’ll talk more about the Canon stuff). Why I don’t like those? Canon’s unit has a very short tested range – about 15m and some issues in daylight and position. Canon uses a CR123A battery which isn’t handy and costs some bucks. The YN version is an improvement to the Canon version and has a better range, uses AA batteries and a swivel head. 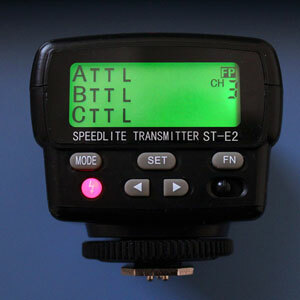 Functions as a wireless commander for the Canon Speedlight units. Provides wireless control up to 35m. How does the Debao is compared to the Canon? Tested range – Canon’s maximum range is about 20m. Deboe’s tested range is more than 40m!!! Use – The Debao has a big LCD screen. This is its biggest advantage, the screen is something amazing for its niche. Power – The Debao uses AA batteries. Swivel head – Debao can swivel rather than Canon’s fixed head. I found only one video review on the net as this is a very new product and has some very good alternatives (YN622 previewed here), however, the review here is very positive! Take a look! Do you have experience with this model? You are right, this looks a gread option for flash control. I find this one really really usable! definitely the best under 100$ controller for in house!